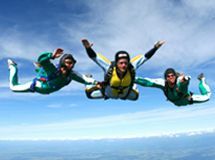 AFF (Accelerated Freefall) is a comprehensive skydiving training course which originated in the USA. 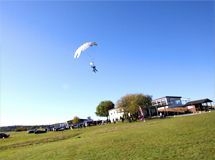 In seven levels, instructed by experienced professionals, complete beginners can learn to skydive in just a few days. Training practice, i.e. the first jump from an aircraft, starts at Level 1. The result: You will jump solo, control the freefall, and learn to safely open the parachute and land. From equipment, through handling, to the jump itself: Safety is our absolute top priority! Over the course of seven levels – theoretical and practical – our experienced instructors will teach you what to keep in mind during a parachute jump. 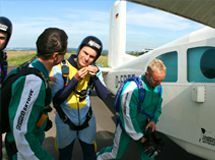 All instructors at Pullout Skydive are certified by the DFV (German Parachute Association) and have thousands of jumps under their belts. Completing your AFF course will be the start of a great passion for a truly breath-taking sport. All our AFF training is in week-long courses, which begin on Sundays with Ground School (FAQ). You can find the dates for the next courses in our calendar. An AFF course begins with Ground School, theoretical instruction on the ground in preparation for the first jump. At Level 1, you will jump from the plane accompanied by two instructors. The main objective is to get used to the freefall. In addition to Level 1, Level 2 covers exercises on turning and „trim controls“ to refine your body position to, for example, make headway. The instructors are still holding on to you during the whole of the jump. At Level 3, the instructors will still hold on to you during the „exit“ stage. If you are falling safely and correctly, though, they will gradually release you, so you can experience the freefall on your own, in accordance with the instructions you have been given. For deployment, the instructors will take hold of you again. Level 4 is the first time you will only be accompanied by one instructor. He/she will still hold on to you during „exit“, but afterwards, you will do a 90 degree turn and then stop on your own! During this jump, you will learn to do 360 degree turns. At Level 6, you will exit the plane solo for the first time. Among other things you will show a back loop and a 360 degree turn, and will deploy the canopy without being held on to by the instructor. Level 7 is your "Graduation-Jump", during which you will demonstrate all you have learned so far. This level also completes your AFF course.